Making sure that a photographer and their client can see images in real time is probably the second most important part of my job as a digital tech (after ensuring data integrity). A dedicated client monitor can be one of the most helpful tools that any photographer can have on set. However, sometimes the constraints of location work can make it impractical or virtually impossible to have a traditional wired secondary monitor set up. Whether I’m dealing with a client video village far from set or a fast paced run and gun shoot where bulky cables can quickly become a nuisance, wireless monitor solutions can be a lifesaver. While wireless monitoring has become an essential tool in the film industry, it’s still a rarity in the stills world. As a result, there’s almost never room in the budget to shell out hundreds of dollars on a Teradek rental, nor does it make financial sense for most techs to spend thousands to buy their own. As a result, I’ve come up with a number of reliable wireless monitoring solutions using equipment I already have on hand and a few specialty items that will cost you a few hundred dolls rather than a few thousand. For the most critical wireless applications, I like to use use the Mac's built in screen sharing functionality. I’ve found it to be by far the most reliable and flexible solution in my arsenal. For this setup, you will need a quality computer monitor (ideally one that matches the resolution of your main display), an additional laptop, and a decent wireless router. I use a 15” MacBook Pro Retina and an Airport Extreme, but really any Mac laptop (or even a Mac Mini) and quality WiFi router will work great for this setup (though I would stay away from the latest 12” MacBooks due to their single USB-C port and underpowered integrated graphics). I see a lot of techs using an Apple TV to facilitate the screen sharing, but I’ve found AirPlay to be far less reliable and significantly more laggy than a laptop solution. For my setup, I use a Super Clamp with a snap in baby pin and an Inovativ Digiplate Lite to mount the laptop to the rolling monitor stand. Typically, I will mount the laptop vertically in clamshell mode and connect an external mouse and keyboard to keep a lower profile. Make sure both computers are connected to your dedicated WiFi network. It’s best to use a 5G network in open spaces, but if your WiFi signal needs to travel through walls, a 2.4G network might be more stable. The great thing about screen sharing is that you also have the option to control the capture computer remotely, just like you would with a wired setup. And since the monitor itself is still wired to a computer, this setup also allows for more accurate color management. To make it a truly wireless setup, I usually power the whole rig off of my Paul C. Buff Vagabond Mini batteries. They only support 120W continuous whereas the monitor and laptop together can pull as much as 170W, so though it adds additional bulk, I use two batteries to power the monitor and computer separately. I admit, an Anker Powerhouse, Goal Zero Yeti 400, or even a Vagabond Lithium Extreme (VLX) would be a much more elegant solution with the proper mounting rig, but since I only have to use this setup a few times per year, I get by with what I already have available. Pro Tip - You can also use this rig as a fantastic compact tethering station if you absolutely require an Eizo on set but a full cart setup isn’t ideal. In general, I love sharing the inner workings of my kit with other digital techs, but I’ve been keeping this little magic box a closely guarded secret for the past year. Now I’m spilling the beans exclusively for my loyal readers! A reliable wireless HDMI solution for under $300? Sign me up! Before I bought this system I was considering splurging on some Teradek transmitters, but why shell out thousands of dollars when you can spend a few hundred dollars for nearly the same result? I decided to take a gamble and pick one up after working with a director of photography who was using this same system as a budget alternative with his RED Epic rig, and I was absolutely blown away by the performance. After a year of use in my own kit, I can’t say enough about how much I love the Nyrius transmitter! For my setup, I attach the receiver to the back of the monitor using velcro and power it with an Anker PowerCore 13000mAh battery, which typically lasts all day and then some depending on how far away the transmitter is. The receiver requires 2A of power, so most monitors’ USB outlets probably won’t provide enough juice. Again, I usually power the monitor itself with a Vagabond Mini if AC power isn’t available. The transmitter comes with a right angle adapter, so you can plug directly into a Retina MacBook Pro’s HDMI port and maintain a low profile. I use a smaller Anker Astro E1 battery (from my TetherBoost rig) to power the transmitter as it only requires 1A. The whole system is pretty much plug and play which I love, and it works on the first try about 95% of the time, but I wish I could manually select the wireless channel, and occasionally it takes a few attempts to establish a connection. As advertised, there is virtually zero lag - far less than screen sharing. Range is rated at 100ft, and I can confirm that it generally works fine at 50’ (I haven’t gone much further than that). Line of sight isn’t required but it doesn’t like going through more than one or two walls. I’m seriously impressed by this thing! There are a couple of drawbacks worth noting, however. My biggest complaint is that I can only get my Eizo monitors to display at 1920x1080 and 30Hz with this system, so there is a bit of letterboxing on the top and bottom edge. It also seems that the wireless signal compresses color gamut quite a bit with the default color profile, adding a fair amount of saturation and contrast. However I have found that if I calibrate with ColorNavigator while connected wirelessly (though you’ll need to connect a USB cable for calibration), the color is quite accurate, certainly better than an iPad. I can’t speak for performance with monitors that don’t feature hardware calibration. Furthermore, the system can only be used with a single receiver, so you don't have the option to wirelessly stream to multiple monitors. Because of these drawbacks, I use this as a secondary or backup solution to the screen sharing setup. But its small enough to keep in my monitor case all the time, so I love having an easy option to go wireless if I suddenly find myself in a situation where its necessary without prior arrangements. 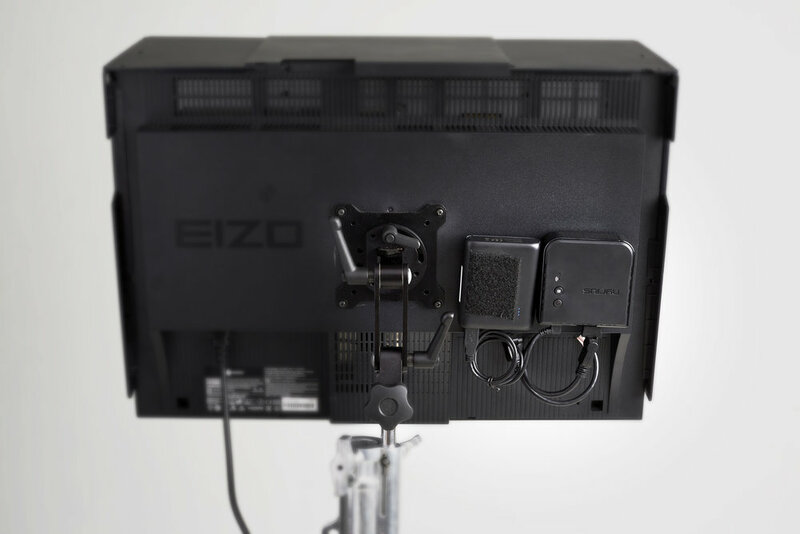 Sometimes it doesn’t make sense to drag an Eizo around on location, but you still need a decent mobile monitoring solution that’s more reliable than an iPad. I’ve been looking at GeChic’s mobile monitors for over a year now, and I finally pulled the trigger and ordered a 1303H model. It will be arriving soon and I’ll update this section once I have spent a little time working with it, but for now, here are some of the reasons I got this particular monitor and how I plan to use it. When it comes to compact ultra mobile monitor options, there aren’t many choices out there. None have particularly wide gamuts, and most options that are out there send power and the display signal over a single USB cable. While this is fine for windows PCs, macs don’t support USB displays without additional drivers. The GeChic monitors, however, have micro HDMI and a variety of other display inputs, so you can use them with a mac just like any other monitor, with native mirroring and rotation capability. You can even calibrate them with i1 Profiler! Better yet, they only requite 5V 2A of power, so they can be powered over USB by an Anker battery. And of course, I will be testing the Nyrius transmitter in conjunction with this monitor as a completely battery powered wireless solution. I have a strong feeling that this setup could completely replace my iPads as my go to compact wireless solution. I don’t currently own a 12.9” iPad Pro, but the GeChic has a 13.3” display and is less than half the price of the cheapest iPad Pro and should be a lot more flexible and reliable! GeChic makes a few other monitors including some 15.6” models, an 11” model, and some with touchscreen capability. The first reason I went with the 1303H is its size. 15.6” just seemed a little large, and the 1303H will be more compatible with off the shelf mounting solutions like the Tether Tools AeroTab L4. I opted against a touchscreen model since I’m using it exclusively with Macs, which don’t currently have great support for touchscreen monitors. I also wanted something that had at least 1920x1080 resolution, whereas a few models only support 1366x768. Unfortunately, the don’t offer a 16:10 1920x1200 model which would make mirroring with an Eizo a lot cleaner. But since the Nyrius also has the same limitation, this shouldn’t be much of an issue. There is also a newer 13” model, the 1305H, which has a few improvements over the 1303H, however it uses a single proprietary breakout cable for both power and HDMI, which I figured would be far less reliable and difficult to replace. The only real drawback I could find about the 1303H is the ugly white bezel! More updates to follow as I get some real world experience with this setup. Maybe a wireless monitor could do wonders to speed up your workflow on your next shoot but you don’t have a spare MacBook pro on hand, or perhaps you’d rather not even spend $300 on a wireless transmitter setup. I get it, these solutions are a luxury, not a bare necessity. If a remote display is essential to your next job but you want to get by with what (I’m guessing) you already have on hand, an iPad is the way to go. For many years, Capture Pilot was the only practical solution for using an iPad as a wireless display. But poor reliability, a lack of features, and Phase One’s apparently limited commitment to developing and improving the app have led many of us to explore alternatives. Luckily, a few fantastic apps have launched recently that allow for additional options for using the iPad as a secondary display. While Capture Pilot allows the user to browse images freely, sometimes mirroring the capture computer’s display is more practical or appropriate. For this, I use Astropad, an app which allows you to mirror a Mac’s display wirelessly to an iPad. Therefore, the iPad acts more like a traditional client monitor. The tech is in control of what is on screen, which can be a huge benefit when there are, shall we say, overly creative clients on set. An added bonus: Astropad in conjunction with an iPad Pro and Apple Pencil can be used just like a Wacom Cintiq tablet (the app’s intended purpose, but for me its more of a handy bonus feature for travel jobs where bringing a Wacom tablet in the kit might not be practical). However, one drawback I’ve found is that previews in Capture One seem to render far slower than they do on the display that AstroPad is mirroring. And unfortunately, Astropad can only mirror an existing display rather than be used as an independent second display (unless you want to take a gamble and pre-order Astropad’s $70 “Luna” dongle which enables this capability). Luckily, the host application doesn’t seem to require much CPU power from the capture computer, so running Astropad has a negligible impact on Capture One performance. If you prefer to use the iPad as a second monitor, your best bet is Duet Display, a fantastic app developed by a team of ex-Apple engineers which allows your iPad to act as a second display. I tested previous versions of Duet Display last year and decided not to add it to my arsenal after experiencing a number of bugs and dropped connections, but recently I gave it another chance and the latest version has proven to be incredibly stable. Recently, I added iPads running Duet Display to all of my studio kits for use as a dedicated focus check monitor and its been a fantastic solution for my old floating focus tool that always got in the way of everything! And since it offers limited touch support, You could also use it with a secondary viewer window in capture one as a “clean viewer.” Duet Display has easily become my new favorite app, but there is one major caveat: it requires a wired connection. I’ve been using it with a 10 ft Anker PowerLine+ lightning cable and haven’t had any issues, and adding a 15’ extension works pretty well too if you need to be further from the computer. Duet Display also offers limited touch support, so there are plenty of other possibilities that aren't possible with a typical display. Like Astropad, the host app barely requires any CPU power so you won’t notice any performance decrease in Capture One. If you absolutely require an iPad to be a wireless second display, you could try Avatron’s Air Display. Admittedly I haven’t tested it recently, but I did do some testing with the previous version a couple years ago and I wasn’t terribly impressed. Based on recent reviews, it sounds like it still isn’t the most reliable solution. Though a secondary display might seem like a totally logical use for an iPad, keep in mind that without a native solution from Apple, it seems that it is a feat that requires quite a bit of software trickery. These apps have come a long way since they all launched a couple years ago, but don’t expect any of them to perform 100% correctly 100% of the time.